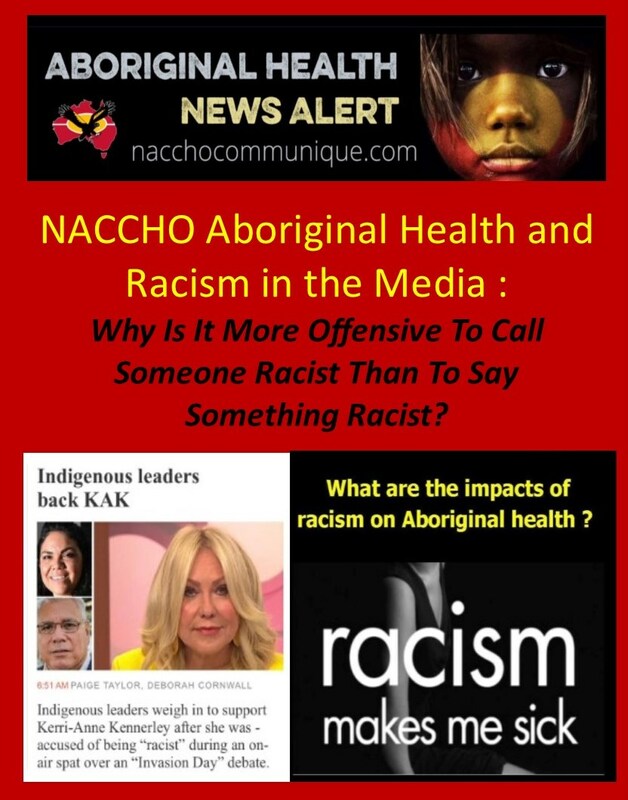 NACCHO Aboriginal Health and #Racism in the #Media Debate : @ShannanJDodson Why is it more offensive to call someone #racist than to say something racist? ” On Monday Studio 10 co-host Kerri-Anne Kennerley berated January 26 protesters. Indigenous people have had to listen to centuries of non-Indigenous people denigrating and demonising us – that we are a problem to be fixed. The minute that is called out, there is discomfort that the status-quo is not being maintained. It is an immediate and lazy defence mechanism to be offended by being called a racist, rather than unpacking why what you’ve said is perceived as racist and challenging your own stereotypes. January 26 symbolises when these social issues began for our communities. We cannot deal with the current violence, injustice and pain without looking at ourselves in the mirror and into our history. 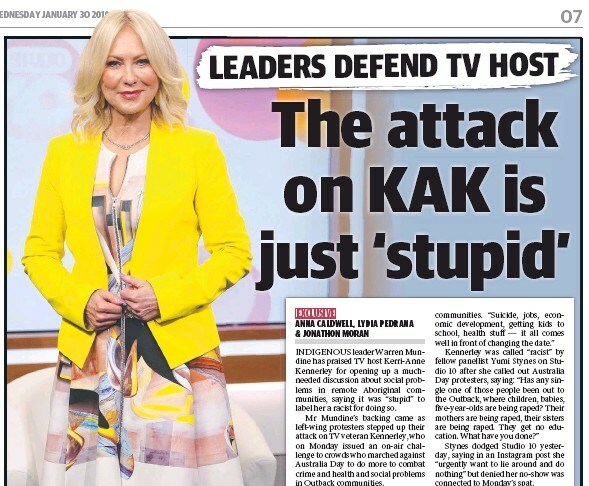 ” The Australian have an article out at the moment headlined ‘Indigenous leaders back Kerri-Anne Kennerley in racism row’. The article interviews three members of the Liberal Party for their views on it, suffice it to say that they were all pretty cool with KAK’s comments. 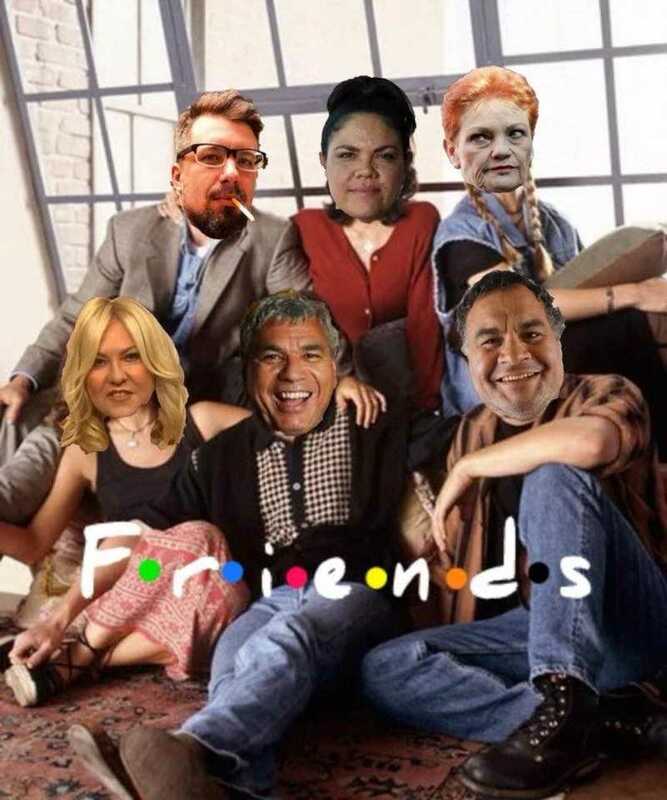 Apparently the Australian are the deciders on who gets to be an ‘Indigenous Leader’, so even though IndigenousX is a site that privileges Indigenous voices, we thought we’d take a different tack on this one. 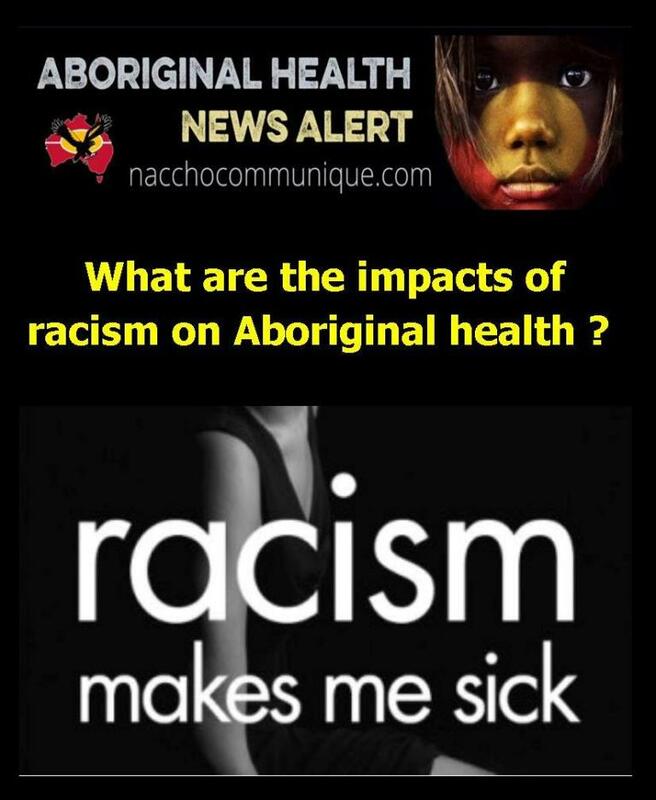 ” The media should take time to reflect on their own views, biases and opinions about Aboriginal and Torres Strait Islander peoples, and use facts and editorial judgement to challenge, rather than reinforce stereotypes. It didn’t take long for lines to be drawn and sides to be chosen in the latest drama out of Ten’s morning panel show Studio 10. 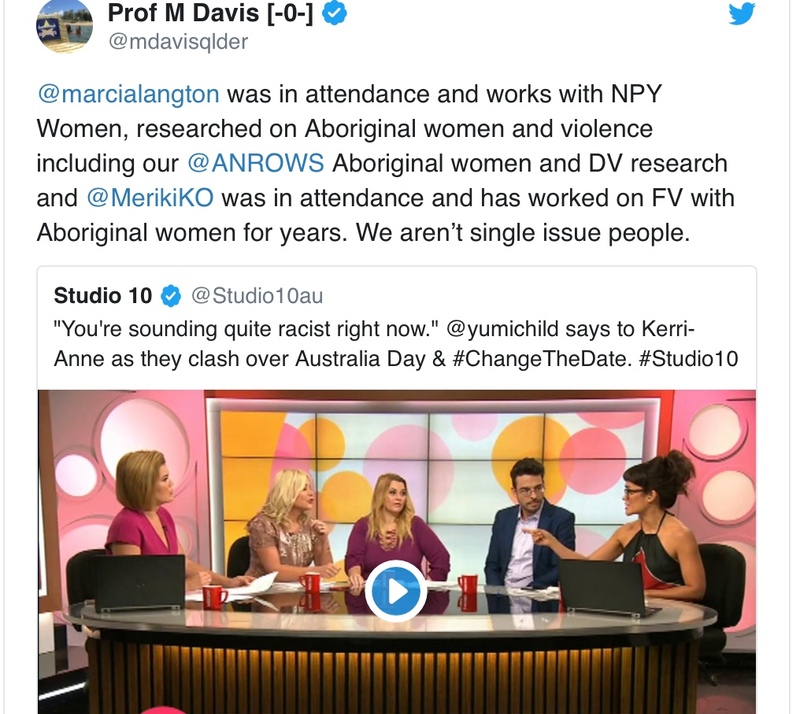 Panellist and Logie Hall of Famer Kerri-Anne Kennerley suggested those marching to change the date of Australia Day didn’t care about social problems and crime in Indigenous communities. Guest panellist Yumi Stynes — the only non-white person on the panel — said Kennerley sounded racist. Well! KAK was very offended (as people increasingly are when they are called “racist”). 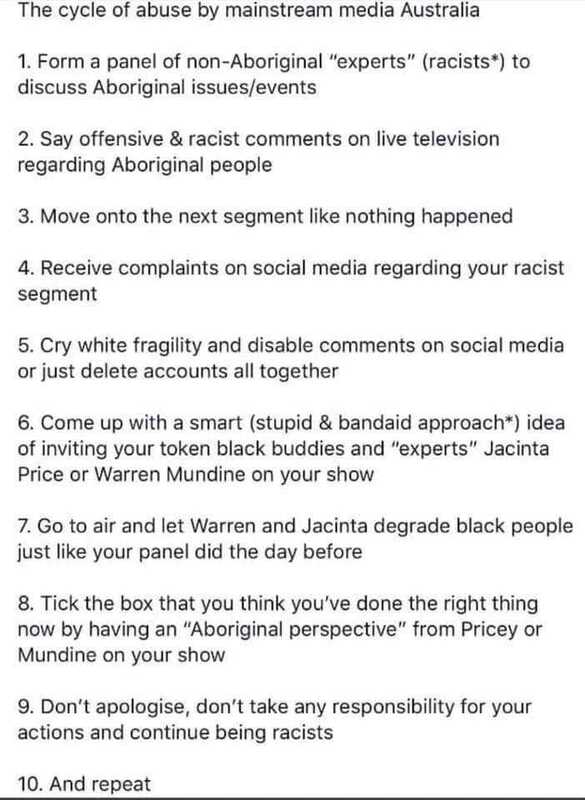 Producers followed up yesterday by having two Indigenous guests with opposing opinions on the show — Alice Springs town councillor Jacinta Price and former Victorian MP Lidia Thorpe. Meanwhile, the commentariat has fully embraced this latest battle in the culture wars. Most traditional and conservative media are supporting Kennerley. 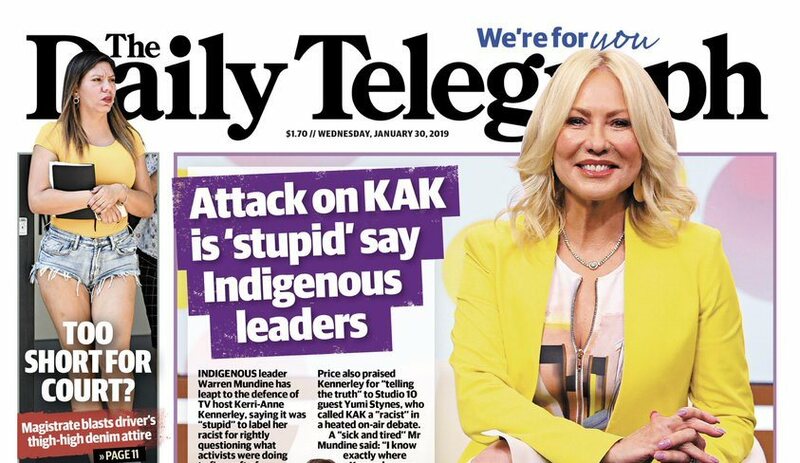 Sydney’s Daily Telegraph today has come out in full support of KAK — she’s on the front page, with Indigenous leader Warren Mundine saying it’s “stupid” to call her racist. Inside the paper, an opinion piece from Jacinta Price that supports Kennerley is given prominence over a counter-opinion from retired Indigenous figure skater and archaeologist Lowanna Gibson. Its editorial says Stynes “played the racism card”, while on the opposite page the cartoon shows Stynes calling a barista racist for offering her a “short black” coffee. The Tele‘s broadsheet stablemate The Australian has also run an opinion piece from Jacinta Price, and quotes Indigenous Health Minister Ken Wyatt as defending Kennerley. Andrew Bolt has used his Sky News program and his blog on the Herald Sun website to support Kennerley’s position. Over at Sydney’s 2GB, Kennerley defended herself on Ben Fordham’s programbefore KIIS’ Kyle and Jackie O called Stynes and Kennerley to talk to about the spat. Daily Mail Australia, which loves any kind of morning TV drama, has been dining out on the brouhaha, rewriting and churning out its own versions of all the commentary and developments. 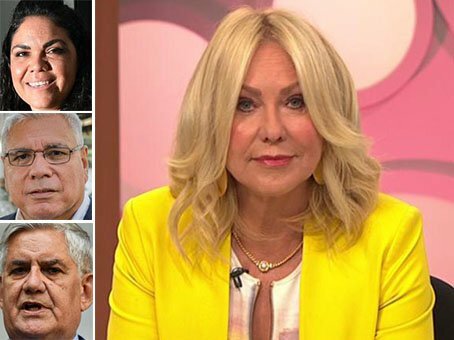 Junkee‘s coverage of the story relied more heavily on social media commentary than specific criticism of Kennerley’s comments, whilePedestrian took a swing at breakfast TV more generally and and flat-out called Kennerley’s comments “racist” without qualification (which other outlets were reluctant to do). Meanwhile, Indigenous X founder Luke Pearson has published a piece satirising The Australian‘s coverage. 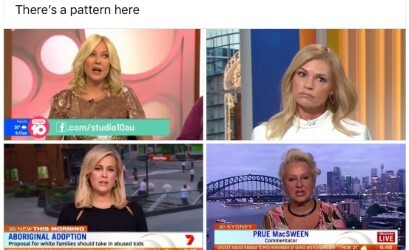 It is not a coincidence that the most recent examples of media personalities being called out for being racist have been white women (although white men often make an appearance as well) — think Sonia Kruger, Samantha Armytage, Prue MacSween. They were not removed for ‘their wellbeing’, they were removed due to racist policies that also saw my Anglo Grandfather jailed for 18 months for loving my Aboriginal grandmother — because it was illegal to cohabit with an Aboriginal person. Kerri-Anne Kennerley also goes on to say “Throwing words around can be dangerous and very, very hurtful”. But frankly, I’m tired of carrying the weight and having to constantly justify my humanity and educate the 97 percent of Australians about why saying inflammatory, ill-informed and stereotypical things are racist. We need more people like Yumi to step up and share the burden and call out racism in all shapes and forms. Morning television has a reputation for being typically, well, sedate. But on Monday’s episode of Studio 10, the panel engaged in a debate that has left people fuming. 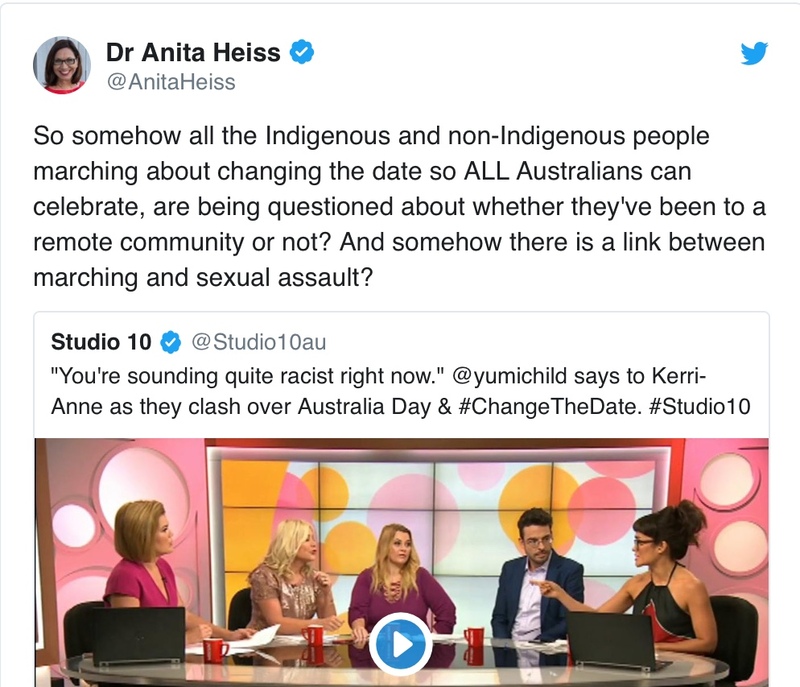 It centres around an exchange between daytime television stalwart Kerri-Anne Kennerley and presenter Yumi Stynes regarding protests that took place around the country on January 26, which called for the date of Australia Day to be changed and to highlight ongoing oppression and disadvantages experienced by First Nations people. To Stynes, the comments sounded “racist”; an accusation that left Kennerley “seriously offended”. “Just because I have an opinion doesn’t mean I’m racist,” she replied. Of course, it should be noted that Kennerley was raising a question rather than making a direct accusation. But it was clearly a loaded one. 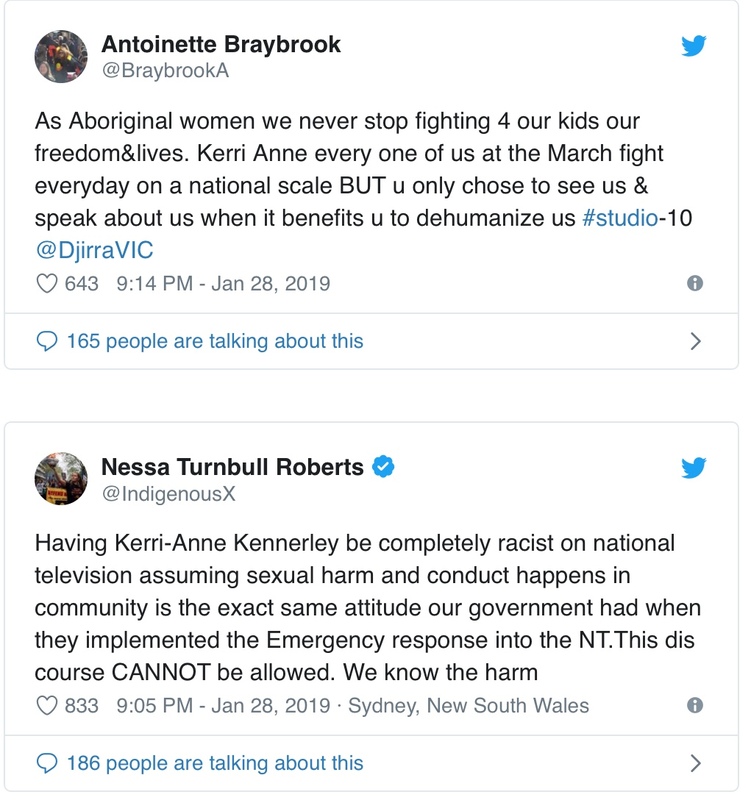 Author/filmmaker/actor Elizabeth Wymarra, who was among those to lead a protest against Kennerley outside Channel 10’s Sydney HQ this morning, argued that the premise of Kennerley’s question was not only presumptive and unfounded, but hypocritical. “There was over 50,000 people that came out and marched in the Invasion Day march in Sydney, and a lot of those people were non-Indigenous people. They were non-Indigenous people who care about the oppression and discrimination of my people,” she stated in a Twitter video. “They’re in solidarity with us, unlike you, so it seems… Last time I checked, I don’t see you coming into my house, or my community, helping my people. So who are you to point fingers at people going to marches? Stynes’ criticism of this statement was that Kennerley was implying that “women aren’t being raped here in big cities, and children aren’t being raped here in big cities”. In other words, that sexual violence is a remote Indigenous issue rather than a national one. That’s clearly not the case. Australian Institute of Health and Welfare data indicates that one in five women around Australia have experienced sexual violence since age 15. There is evidence that Indigenous Australians are more likely to experience sexual violence, though. According to the AIHW, in 2016 the rate of Indigenous sexual assault victims (ie. per 100,000 people) across NSW, Queensland, Northern Territory and South Australia was between 2.3 and 3.4 times higher than that among non-Indigenous victims. When it comes to sexual violence against children, the picture is similar. In 2016 the rate of Indigenous children, aged 0–14, recorded by police as victims of sexual assault in the above states was approximately twice that of non-Indigenous children. Importantly though, data on the sexual assault of women and children in remote Indigenous communities specifically – or “the outback”, as Kennerley put it – is not comprehensive. The claim that there’s “no education” in outback communities is quite obviously not true. According to Creative Spirits, there are reportedly 17,000 Indigenous children attending school in remote areas. That being said, there are barriers to accessing education in particularly remote communities. including availability of teaching staff, transport, weather cutting off roads, etc., which impacts attendance rates and outcomes for Indigenous students. For example, while attendance rates among Indigenous students in inner regional areas stood at 86.8 per cent in the first half of 2017, it dropped to 64.6 per cent in very remote areas according to government data. But overall, nationwide stats show that the majority of Aboriginal and Torres Strait Islander students attend school and are achieving national minimum standards for literacy and numeracy. Indigenous university enrolment has also more than doubled over the past decade. Kennerley responded to that the backlash this morning on Studio 10. While again taking issue with being labelled racist, this time she made an important distinction. She used the word “some”.